It has recently come to mentalgiant's attention that Zimbabwe has a currency crisis of epic proportions. 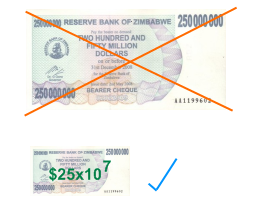 With hyperinflation and the need to produce larger and larger bills they are soon going to run out of space for all the necessary zeroes. Mental giants recommends that they switch to scientific notation. This will save ink and allow inflation growth to truly legendary proportions. As there is a shortage of bank note paper they may also consider using scientific notation to reduce the physical size of their bank notes. 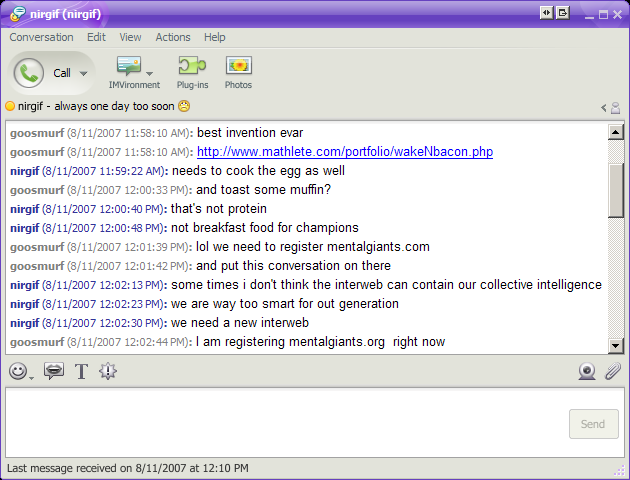 As it has been quite some time since the mentalgiant has had time to post (given all of the world changing activities that mentalgiant is involved with this is not unexpected) mentalgiant feels its time to share the spotting of a fellow mental giant. A LEARNER driver accused of doing burnouts in a Perth police station carpark has been charged. Police at the Cannington station heard the squealing of tyres and went out to allegedly see the 24-year-old Maddington man spinning the wheels of his Ford Falcon in the station's front carpark at 12.30am (WDT) yesterday. The man's car was seized for 48 hours under Western Australia's hoon legislation. He was charged with reckless driving, driving contrary to a learner's permit and driving under the influence of alcohol, and will appear in the Perth Magistrates Court on Thursday. The lesson here for mental midgets is that one should wait til at least P-plates to ensure one has the skills to outrun police before doing burnouts in a police station carpark. It is the mentalgiant's opinion that the Axe would win vs Riot Shield, if only due to the sheer mass of the axe-head raining down upon the puny riot policeman (or woman) supporting said shield. Having watched many Westerns, mentalgiant believes that the Plate Armor would hold its own against a small firearm. Depending on the insulation used behind the Chain Mail (probably none), it is likely that the Taser would get the better of said armor wearer. Conclusion: if going to war today it would be prudent for the modern soldier to wear armor of some sort, preferably non-conductive, and carry an axe alongside his/her gun. Lately there has been a lot of talk about global warming and the need to reduce carbon emissions. Well talk is cheap. In this blog post I propose that all of us take action today. Immediately after reading this blog post you should take one less breath per day. If you can handle it tomorrow you should take two less breaths. But if not, do not worry, because if everyone takes one less breath we are already making amazing progress. Let me show you some fancy numbers. You see there are over 6.5 billion people on earth. Each breath is on average 0.5 L. Carbon dioxide is typically 4.5% of the average breath. Each litre of carbon dioxide gas weighs 0.00198 kg. Hence in one year we would save 4.5% x 0.5 x 6.5 x 10^9 x 0.00198 kg x 365 of carbon dioxide. In one year that is 105,694,875 kg of carbon dioxide. That's over one hundred thousand tonnes of carbon dioxide a year if each of you would just take one less breath every day. 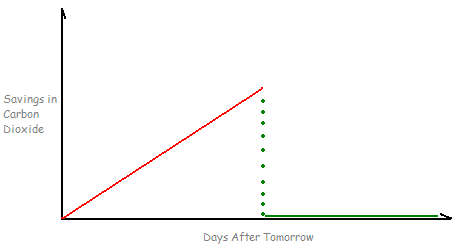 The precipitous drop in the graph occurs a little over 59 years from now. The average person breathes 15 times a minute or 21,600 times a day. Hence roughly 59 years from now those diligently doing their bit to reduce carbon emissions shall have stopped breathing and will be dead. The savings at that point would be truly astronomical.